The numbers speak for themself. Thirty teenagers, 50 cars washed and $800 raised. On Tues., July 19, the community came together to support one of its own. The Teen Travel Camp at the Jewish Community Center of Dallas hosted a car wash to benefit Marine Lance Corporal Brian Aft. Aft, 23, lost both of his legs in April, when he and four other marines stepped on an improvised explosive device (IED) while in Afghanistan. Abbii Cook, youth director at the J, said it was meaningful to do something for the Aft family because they have been active in the Dallas Jewish community. In spearheading the project, she wanted to teach her campers about the importance of mitzvot. “This summer, I am teaching my kids about tikkun olam and giving back,” Cook explained. “The Aft family has given so much to the Dallas Jewish community and any little bit we can do to give back is important.” Becky Slakman, Aft’s mom, was a previous youth director at the JCC. His sister, Elyssa Aft, is a camp counselor, and Brian, who grew up in North Dallas, attended camp at the J as a child. From beginning to end, the campers took on all aspects of the car wash from making posters, to standing outside in 100-degree heat directing people, to washing the cars. Throughout the summer, the teens have also collected money for the Mitzvah for a Marine Fund, with all donations going toward Aft’s recovery. 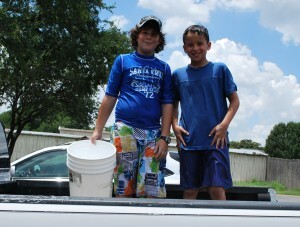 Nir Rauch (left) and Zach Lampert wash a truck at the Teen Travel Camp car wash.
Aft attends physical and occupational therapy daily, and continues to get stronger and more independent everyday, Slakman added. Another milestone occurred last week when he had his external pelvis pins removed. Last month, Aft was promoted to Corporal and received his Purple Heart Medal. To see a video related to the story, visit www.tjpnews.com. For information about how to donate to the Mitzvah for a Marine fund, contact Sam Insel at 214-615-5239, or sinsel@jfgd.org, or visit www.jfgd.org. Through July 31: Write a check payable to Jewish Federation of Greater Dallas, with the word “Marine” in the note area. Mail checks to Jewish Federation of Greater Dallas, 7800 Northaven Road, Dallas, TX 75230. After July 31: Donations, which are not tax-deductible, may be sent to: Norman Slakman, C/O Silverthorn, 5960 W. Parker Road, Suite 278 Box 134, Plano 75093.